Tabletops, elliptical picture frames, and signs! Tabletops, elliptical picture frames, and signs are just a few of the woodworking projects you can make using the Fulton Ellipse and Cirlce cutting Jig. It's easier to set up and even easier to use to create a perfect ellipsee or circle. By mounting your router on the jig arm and laying out your pattern, you are set to make ellipses or circles of varing sizes. 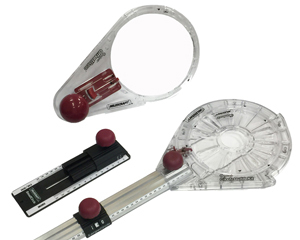 this sliding jig system allows for circles up to 52" in diameter. the jig is predrilled for most porter cable 690/890 routers and routers with 6" base footprint. Depending on your router you may need to drill your own mounting holes into the jig. Made from laminate and HDF material. Shop Note: If you have a Venturi Vacuum Switch (not included), you may use the vacuum to hold the base to your project instead of using wood screws. The Ellipse & Oval Cutter with Universal Base is used with your router to make circles from 25-1/4" to 90" diameter or ellipses from 25-1/4" x 29" to 79" x 88". This jig allows you to make Ellipse and/or round table tops as well as mirrors, picture frames and specialty moldings. Secures quickly and easily to your workpiece by placing four screws through the corner mounting holes on the universal base. 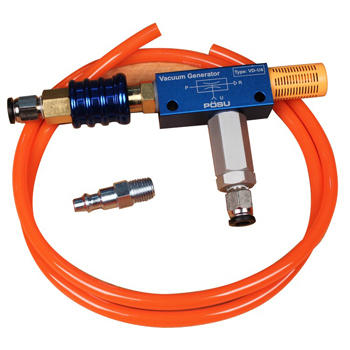 Or the universal base will work with a venturi vacuum attachment (Not Included) for 500 lbs. of solid clamping pressure. The Ellipse & Circle Cutter with also includes a pre-drilled universal router base plate that is designed to work with most of the popular routers. 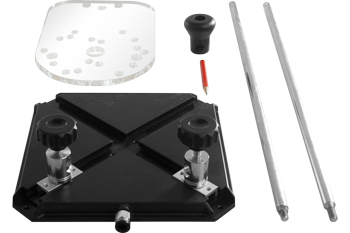 The heavy-duty clear Universal Router Base Plate is pre-drilled to accept most routers (including 3HP) and has visibility of work area and the router bit. Cut ellipses with a major/minor diameter difference of up to 9". Cut circles from 25-1/4" to 90"
Cut ellipses from 25-1/4" x 29" to 79" x 88"
Note: The Vacuum Switch can be used with Item #3440 Fulton Ellipse Jig for secureing the base with suction instead of screws. This Vacuum Swtich turns any air compressor into a real suction machine. Just plug your compressor into one end, move the switch to the vacuum setting, and plug the other end into your vacuum device. The outward pressure exerted by your compressor is used to pull air out of the vacuuming end of the switch, allowing you to use vacuum bags to make laminate work, secure suction base products (like our Elipse Oval and Circle Cutting Jigs), and even power vacuum form systems for plastics and fiiberglass. 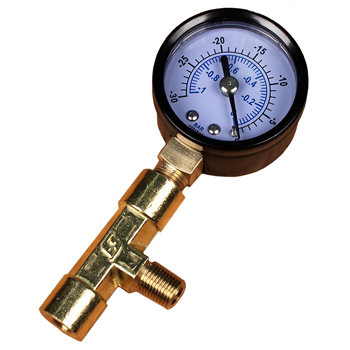 To get accurate vacuum pressure readings on your Venturi Vacuum Switch (VEN-001) you'll want to use this high-quality gauge and brass t-fitting. The gauge features vacuum measurements in both Bars (blue) and Inches of Mercury (black). 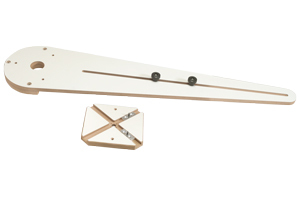 Trend's Mini Ellipse Jig is ideal for routing elliptical or circular picture frames, mirrors, clocks and small tables. This jig cuts ellipses from 8-5/8-Inch by 6-1/4-Inch up to 22-1/2-Inch by 20-1/2-Inch and circles from 6-1/4-Inch up to 23-3/4-Inch. It is easily adapted to mark out the ellipse or circle prior to cutting. 8-5/8" by 6-1/4" up to 22-1/2" by 17"
Cut small and large circles from 1.5” in diameter to 51” in diameter with the CircleGuideKit. With the included TurnLock™ base plate, this product is compatible with most routers. There is no longer a need for that homemade circle cutting jig, the CircleGuideKit does it all for you and includes everything you need to cut your desired circle. It also includes a BONUS Offset Base for finishing edges on your work piece. Cuts circles from 1.5" to 12"
Cuts circles from 10" to 51"
Turn your dremel into a plunge router! The Milescraft Rotary Tool Plunge Attachment converts your rotary tool into a mini plunge router. It features an integrated vacuum system, easy-grip handles for comfort while working, and a clear TurnLock base for optimal visibility. This attachment is made with sturdy construction, including steel posts, locking depth stop and a one-touch release. 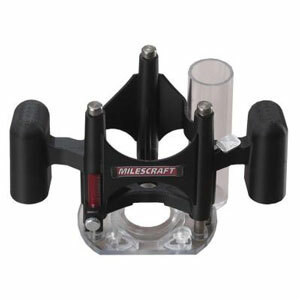 Ideal for use with Milescraft's Model 1204 Spirocrafter, this attachment fits most rotary tools including Dremel, Black and Decker and Craftsman. A circle and edge guide are included for miniature edging and dados. Our router compass will allow you to cut perfect circles, perfect arcs, and radius corners for large or small tabletops, lazy susan's and wheels with your router. The router compass will also cut circular grooves in your stock ranging from 8'' to 48'' in diameter. A steel point provides secure pivoting and adjusts quickly with a locking knob. 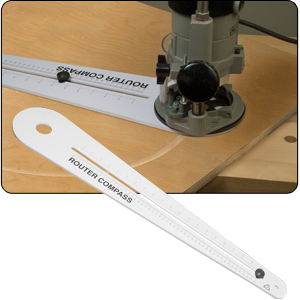 The knob moves through out the center of the router compass to allow you to make virtually any size cut up to 48". The router compass is made from a clear acrylic plastic to see where you are routing and it also has clearly labeled measurements that are easy to read. No more searching through stacks of templates to find just the right size circle for your project. 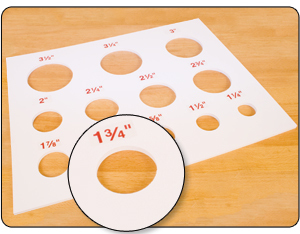 This template has 12 of the most common size circles pre-milled into a durable 3/8" thick acrylic sheet. Each size circle is clearly labeled for quick and easy identification. This template is designed to be used with a 5/8" short shank template guide bushing (not included).